The Book of Joshua is like an exciting novel -- the miraculous crossing of the Jordan river, the crash of Jericho's walls, the sun stopping in the sky. We are amazed at God's faithfulness and power. The battles we face today are different, but very real. We are challenged by false values, temptations, discouragement, and stress at home, school, and work. 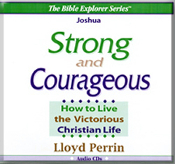 This practical cassette series will help you to be strong, courageous and victorious. Lloyd Perrin teaches the timeless truth of God's Word as the answer to all our needs. He has a Doctorate of Ministry, focusing on the Dynamics of Worship. His friendly, energetic style makes it fascinating and fun to learn and apply the powerful principles to your life.